Keeping with the challenge from the past two weeks, I have a NEW green challenge for you! 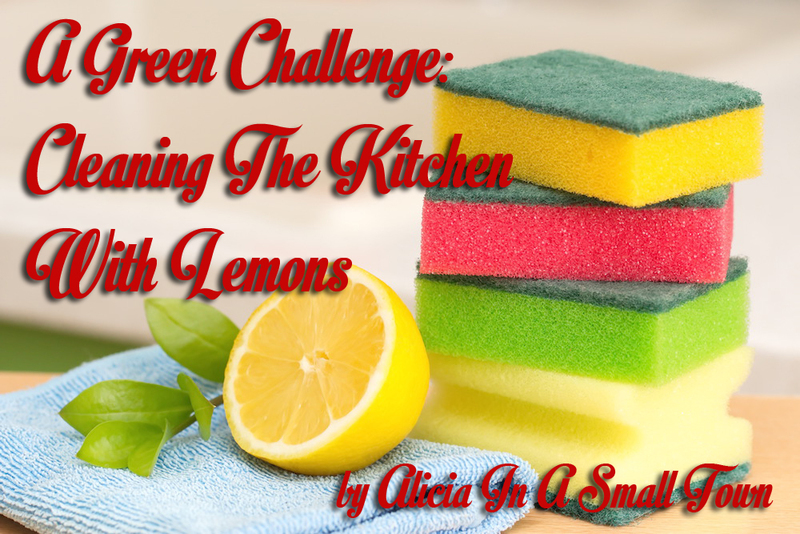 This one involves cleaning the kitchen with lemons! Here you will find every way I can think of to clean the kitchen with lemons! Some of the things you will see here call for lemon oil, and you can find that easily on Amazon! Without further ado, here are all the ways that I can think of to clean your kitchen with lemons! Windows– Wedges of lemons can be rubbed over windows to clean and shine them effectively. Squeeze the wedge of lemon as you rub to release some of the lemon juice and wipe with a dampened cloth immediately. Then buff with a clean, dry cloth to produce a shine. Glass and China– Remove limescale build up from china and drinking glasses by making a solution of water and lemon juice. Use the two ingredients in equal quantities and let this solution sit in the cup or glass for several hours. Then wash as normal in hot water and detergent of your choice. This also helps remove stains in cups from tea and coffee. Odor on wooden surfaces– kitchen worktops and cutting boards can harbor harmful germs and soak up odors. Rub half a lemon liberally over the wooden surface, allow the juice to dry fully, and then rinse off with cold water. This will disinfect the surface and remove any unpleasant smells. Dishwasher cleaner– Cut a lemon in half and impale it onto one of the upright prongs inside of your dishwasher. The acid in the lemon will degrease the appliance and the fresh lemon smell will last for several cycles. Microwave cleaner– Place one or two lemon slices in a microwave safe cup of water and run the microwave on high for 30 seconds. Then, use a dry cloth to wipe away excess steam. Stove top spills– Mix baking soda, lemon juice and warm water. Spread the paste over the stove top. The baking soda is a mild abrasive and the lemon juice has great degreasing properties. Rinse well to make sure that the surface does not remain powdery and then buff dry with a clean cloth. Oven cleaner– Make sure that the oven is completely cool and apply a paste made of two tablespoons of baking soda, one cup of water, and the juice from one whole lemon. Then, clean as usual. Kitchen cabinet cleaner– To make your cabinets look like new, make a solution of two ounces lemon juice and one cup of hot water. Stir the solution and wipe onto your cabinets with a clean cloth. Sink cleaner– Use neat lemon juice and a sponge to coat soap scum and stains in the sink. Allow to sit for a few hours, and then rinse with cold water. This will disinfect and break down any limescale build up. Remove Cheese or Sticky Foods from a Grater– Rub a half a lemon over both sides of your grater when you’ve finished preparing food to get rid of any residue left on it. Rinse when finished to watch any leftover bits float away. Don’t forget the trash can! Put lemon peels in the bottom of your trash can to get rid of unpleasant smells. Did you try cleaning the kitchen with lemons? I didn’t know you could use a lemon for all of this! I usually just throw one down the garbage disposal. Thanks for sharing! Great ideas! I never would have thought of the microwave one. Ours certainly needs to be cleaned! I remember my mom would always tell us it was okay to put lemons in the disposal because it helped give a nice clean scent to the sink. It’s so nice to use natural products to clean instead of chemical. Great tips! I always use lemon in the garbage disposal simply because it smells good 🙂 I have tried heating water and lemon in the microwave to make removing the grime easier. I definitely need to start cleaning my kitchen with more lemons- I can’t wait to try! Lemon is like vinegar it has more uses than you know. I like to use it in tea to soothe my stomach and balance my acid reflux, to clean and as an air freshener. I love lemon for cleaning. I more often use white vinegar (because I tend to always use lemons in my cooking and don’t have any left over!). I do love rubbing the used up lemon halves on my cutting boards though – works like a charm! I have never cleaned the kitchen with lemons. I’ve used products with lemons in it. I’ll have to give some of your ideas a try. My mom always cleans our kitchen with anything lemon or lemon scented – air fresheners, 409, candles, and she puts fresh lemons in the garbage disposal and it cleans it out + makes the whole kitchen smell nice! I love LOVE cleaning my kitchen with lemons. Anything I can do to clean my kitchen naturally is fine by me! The smell of cleaning with lemons is the best! I love keeping lemons in the house, great tips! I didn’t know you can use lemons like this! I just use the lemon essential oil to make everything in the kitchen smell fresh, plus our lunch boxes! Don’t forget the garbage disposal! My dad is a plumber and has people complain about smells coming from their garbage disposal all the time and he always tells them to drop a lemon down and chop it up. Works amazingly every time! Lemons are all purpose cleaners. What I love about them is they don’t just clean thoroughly; they leave the house smelling fresh after using them. I’ve definitely used lemon to clean the sink and garbage disposal! Works like a charm every time. So amazing, effective and natural! Love your blog for these brilliant ideas! Oh wow, such good uses for lemon! Thanks! These are great tips! Those harsh chemicals make my allergies go crazy. That sounds like it would smell soo good! I will have to try this this weekend to see what I think.